Rushed back from London for a BBQ on the beach at Eype in Dorset. Like almost every other outside event since the beginning of June it was rained off. Actually, it was moved. We had a party in a friend’s artist studio. 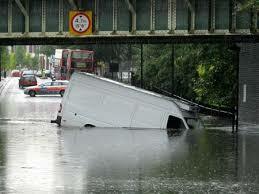 The rain or more accurately the flooding was supposed to be the main item on the Anita Anand Show on Radio 5. I was a panellist on the programme, which runs from 10pm to 1am. They asked us whether we thought flood prevention in Hull and other Northern towns were adequate. Although I’m extremely opinionated I have to say that I didn’t feel qualified to comment on how much has been invested in flood defence in towns I haven’t even been to! (Luckily we had other topics of interest, including Conservative front bencher Alan Duncan challenging defecting MP Quentin Davies on his move to Labour). But I noticed on this week’s Question Time that one member of the audience was convinced this perpetual rain in the UK (and no doubt the extreme heat in Greece) was climate change in action. I think we should wait and see the overall trend information before leaping to conclusions. I worry that attributing every exceptional weather event to a changing climate will only give fuel to the sceptics. Whilst, I’m on the subject to global warming, I was interested to see that Al Gore has been voted as the world’s first choice for green champion. I wonder if that will prove to be a more tempting opportunity than throwing his hat in the ring to be the first Green President of the United States. This entry was posted in BLOG, Done, Energy & Climate, Media & Communications, News 2007 and tagged Climate change, Flooding.